there is an inherently powerful way of codifying thought which is mathematics. it is perhaps man’s greatest achievement. the insights won by users of mathematical thought have given us this interconnected world of today. but what is mathematical thought and how does one assemble its strengths? math is based on patterns and understanding how these complex unified patterns of consequence can be used as languages to describe and delimit. one of the first patternings that man used abstractly i believe is that of number. arithmetic is fundamental to a language of numeracy, and it was historically taught algorithmically. and by making simple concatenations of relationships indelibly memorized one could leap into quick thought about problems of number, statistics, odds, and other simple ways of seeing deeper into number patterns. their systematic study, of course, is something else. addition flash-cards, multiplication tables, subtraction and division; ah yes, even long division were concatenated. this last bridge of fools often becomes the final blockage for those who are still not becoming fluent in numeracy. this system of learning works, but it can be off putting enough for many who fail miserably a good percentage of the time. how can one teach the value of rote learning of beginnings, and that such practice leads to becoming fluent in abstract thought in the richness of another learned language. i taught string figures to recalcitrant math learners for a good number of years in a new york city high school and watched as my students became able to think abstractly in simple sets of patternings that i had developed within my own learning of string figures. what i found to be of the most importance was that they were empowered to do some of their neglected hard-early-work in other subjects to catch up as they had done in math. there is a reason why the british insist the subject is maths, plural. different mathematics are different languages and should be approached in their learning like second languages. when i began my german course in college as a freshman we were asked to stand and point at the window and speak in unison, “das ist das fenster.” my memory says i. a richardson. it works as you build up physical activities with language patterns. think of the old canard about italians and their hands when they talk. the gesture of pointing at the window is a complex reference point for the brain as an instantly retrievable completeness. the small grammatical parts involved in repetitive rote learning pertains in this almost instantaneous retrieval of concepts. german has a different logic than chinese or spanish. the german phrase is “das ist mir wie ein spanisches dorf” (that’s spanish to me). when other patternings such as swahili, fukienese, or cherokee are heard at normal speed that a fluent person uses, it is gibberish for the rest of us. early man (before writing and such, or electronics and computers) learned to process complex patterns in ways we do not experience in today’s fractionalized first world upbringing. and as a last thought. i had a conversation with a navajo man who taught biochemistry in northern arizona university. he described the feeling of wondering why his navajo students were easily the best at visualizing three dimensional complex elements and their reactions. but that now after talking with me it was clear to him that they had trained their minds to think in three dimensional consequential patterning when they played string figures at home. we need to preserve and enrich such complex language fluencies that are lost in our typing and swiping world of visual and aural control. physical analogs of consequential operations are needed early on in the language gathering processes, and it should always be in the plural. A recent article in Science magazine discussed the windows of learning which every person experiences early in their life. Note development of the senses begins before birth and that the language window closes during childhood. That is why a second language is so hard to learn if one begins much past 9 or 10 years of age. 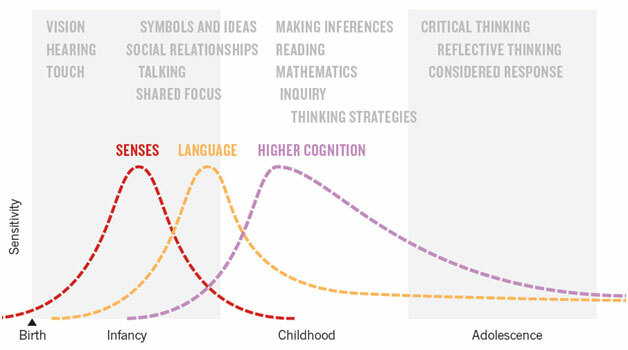 My especial interest as a teacher is the window of higher cognition. •	The hands (especially intricate finger patternings) are a remarkably useful tool for the flowering of the brain’s potential. •	Children and teenagers who participate in learning activities using the hands (playing instruments, learning string figures, etc.) do much better in learning all other subject matters than those who have no such experience . I taught in Music and Art high school in New York City and the instrumentalists tended to be the best all round students. •	It is crucial that this training start early and then continue throughout the time period when the human animal is predilected to learn (say 4 to 24). •	I believe the brain’s explosive growth in the evolution of humans was first led by the hands and only later by the throat, tongue, larynx speech acquisition.